A video that surfaced on social media during the weekend showed the events leading up to when police say a gun went off in a car, shooting a man in the head. The shooting was reported about 2:30 a.m. in the parking lot of a Valero gas station at Almeda Road and Southmore Boulevard. Houston police said that three people were inside the car while the man, identified by friends as Devyn Holmes, 26, and a woman were playing with two handguns. The gun fired, hitting Holmes in the head, police said. A video that was posted originally posted on Facebook and then on Instagram showed what happened before the gun fired. Friends confirmed that Holmes is seen in the video, wearing a white shirt and talking to a woman and another man that is in the car with him. 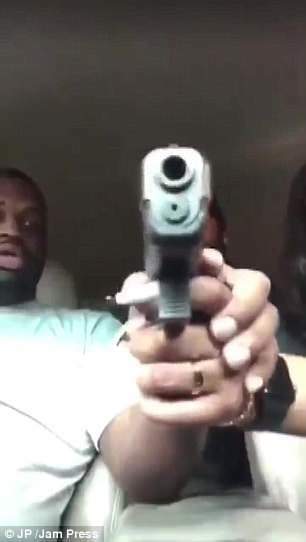 A few seconds later, the woman is seen pointing a gun at the camera and waving it around in the car. “You’re making me nervous,” Holmes is heard saying as he tries to still the woman’s hand who is handling the gun. “It ain’t got no clip, bud,” the other man is heard saying. A second later, the gun fired. Holmes slumped over and blood can be seen on his shirt. The video below has been edited and does not show the moment Holmes is shot. The woman, who police identified as Cassandra Damper, 25, told police that she believed the weapons were unloaded, investigators said. Police said Damper was arrested after she tried to wipe off any gunshot residue that may have been on her hands. She was charged with tampering or fabricating of evidence. The other man in the video has not been charged. Holmes was taken to Ben Taub Hospital, where he is on life-support, police said. Police said the case will be referred to a grand jury to see if any additional charges will be filed.